Perth seems to have decided that this Summer will be a Summer of storms. 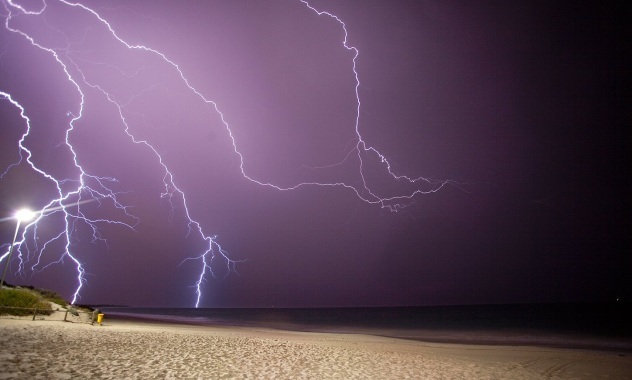 After the lightning display on my birthday, and subsequent storm last Tuesday, last night became a repeat but even larger-scale effort: 44mm of rain over the course of the night (the heaviest Summer rainfall in 60 years, apparently) and power cuts across the state. I feel fortunate that we weren't affected unduly, especially as the storm seemed to be right above us at one point. What's more I managed to fall asleep in the midst of it and sleep until morning, which is almost unheard of (I tend to wake up intermittently)! I much prefer storms to weeks and months without rain, but hope the damage isn't too severe for those who were affected. Leaving storms aside, this post is really about Christmas dinner options. You see, although I haven't eaten red meat for about 12 years, up until this year I still ate poultry on occasion. As a result, this will be my first Christmas without turkey. Rather than finding this off-putting, I have become quite excited about the many, many vegetarian and vegan options available as alternatives. It helps that my Mum is supportive of this stance too - no doubt thanks to her own mostly vegetarian tendencies. I was going to modify and trial some Christmas dinner recipes for this post, and share the results. But I realised that doing so would really be re-inventing the wheel. There are some wonderful recipes out there already, and for most of them I don't want to make any substitutions or changes. Given this, I'm doing a recipe round-up instead. This feels like cheating, but I hope that when you see the recipes below, you'll realise why I don't think modifications (never mind new dishes) are required. Not all recipes are vegan - I've indicated those that are - but all are vegetarian. Johanna from Green Gourmet Giraffe really covers all the bases in the nut roast category, and you can see her collection of nut roast recipes here. I've picked out a few below, but there are many more options on her site. ﻿Clearly, my challenge will be in having too many options! Do you have favourite vegetarian or vegan Christmas meals? We are all of the omnivore type however we cook up a huge smorgasbord every year with lots of salads, so I shall be reading through these links. One of my favourites though is a pumpkin and eggplant salad. Cube up your eggplant and roast till golden. Cube up pumpkin and toss in a mix of brown sugar, cumin and olive oil, then roast (I think I do a tablespoon of sugar to a teaspoon of cumin and enough oil to make a runnyish paste). Meanwhile blanch green beans so they are tender but still crunchy. Put the warm eggplant, pumpkin and beans in a bowl. Add rocket and corriander leaves. Dress with a dressing made of olive oil, balsamic vinegar, honey, salt and pepper. Delicious warm, just as good cold or room temperature. We had rain and thunderstorms over the weekend - sadly we couldn't go to the outdoor carol service but I really felt for the organisers who would have put in so much work! I think you can probably guess my favourite Christmas dishes :-) I have the same nut roast - that you have linked to - every christmas - because it is easy and simple and doesn't overwhelm the side dishes. I usually try something different around Christmas time. Good luck with your first veg christmas dinner - I hope we will hear what you ended up having after all these wonderful recipes - will be bookmarking quite a few of these myself! there are certainly some tasty options there! A vegetarian Xmas does not have to be boring thats for sure! YUMMO! Ooh a vegetarian pie/ potpie is on my to-do list. My mom hated cooking and bought us the freezer chicken pot-pie's all the time as kids. I used to love them! I bet they are hundreds of times better when fresh. Last year I made a lovely vegan and gluten-free chestnut stuffing, salad, and raspberry granita, and I look forward to sneaking in more vegan dishes again this year. Alas, I'm not allowed to bypass the turkey, but at least mum doesn't make me eat the ham! Love the sound of (most :P ) of these Christmas ideas! I've never thought of having a vegetarian Christmas but there are a plethora of yummy salads and all sorts of treats you could have. I'm not into vegetarian "pretend" meats, but tofu and nut roasts sound good! Gosh I've been feeling sorry for us here re the weather, seems like you are having it quite mean too. I am appreciating your links here, so will be checking them out to see if I can make something different for Christmas this year, as i am not that keen on faux meats. Last year I made this Brussles Sprouts pie. Also Good Luck with your first Veggie Christmas, your the second person I know who will be experiencing this, so i do hope its a good one. Looking forward to reading more when the time comes. I loved our thunderstorm last weekend, it was so nice to lie in bed and listen to the crazy weather. Thanks for including my nut roast, I haven't decided what I'll be making yet so it's very helpful to have some extra recipes to consider. I made the Tofurky last year that you linked to which was nice but I had the oven too high and burnt the glaze a little so that was a bit disappointing. Hope you enjoy your first veg Christmas! My challenge this year is trying to come up with recipes for Christmas that don't use the oven. It's really stinking hot this year, and as much as we love seitan roast it will really make the house unbearable. I'm thinking mango-beetroot rice paper rolls, and salads galore. I love that you posted this here :) Thank you - it sounds delicious. Your approach to lots of dishes sounds great too, good for catering to lots of tastes. Thanks Johanna - I did have a few guesses around the dishes you serve :) - and I will certainly update on those I pick. Your purple nut roast has captured my heart so I think that may be one serious contender! Yes, definitely! And making old (meat) favourites vegetarian is always fun - I've yet to be disappointed I think. I chuckled at the thought of you sneaking vegan dishes in! I wonder if you'll take over completely one day? :) My brother was vegetarian from about age 8 to 13, so my family had to accommodate vegetarian options quite early on - he found the thought of eating animals so upsetting. He's a complete carnivore now though! I think it helps being in Australia...our weather suits so many of the salads and side dishes that perhaps would be less appealing in the cold. And yes, I'm looking forward to trying a nut roast - I never have before! Thanks Joanna :) I'm glad some of the recipes appeal. Thank you Shaheen - I think many of your dishes could appear at Christmas as they are generally impeccably presented! I hope some of the links turn up some new ideas for you too. Now I want mango-beetroot rice paper rolls! What a great idea, Christmas or not. Staying with non-oven things does sound sensible though; I think Perth may be in the high 20's on the 25th which is very reasonable, but it's no fun cooking when it's very hot. These are greeeaat menu options!!! Hopefully all was okay with the storm!!! WOW! Thanks Emily :) Everyone I know seems to have pulled through without storm damage, which is great! Thanks Anna, I'm glad you found it useful!